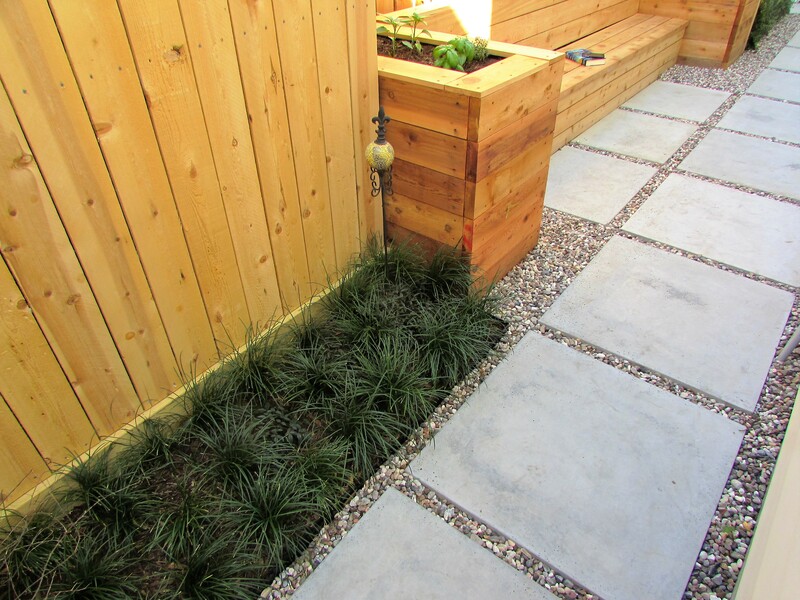 The Challenge Continues – The Tiniest Garden Room YET! 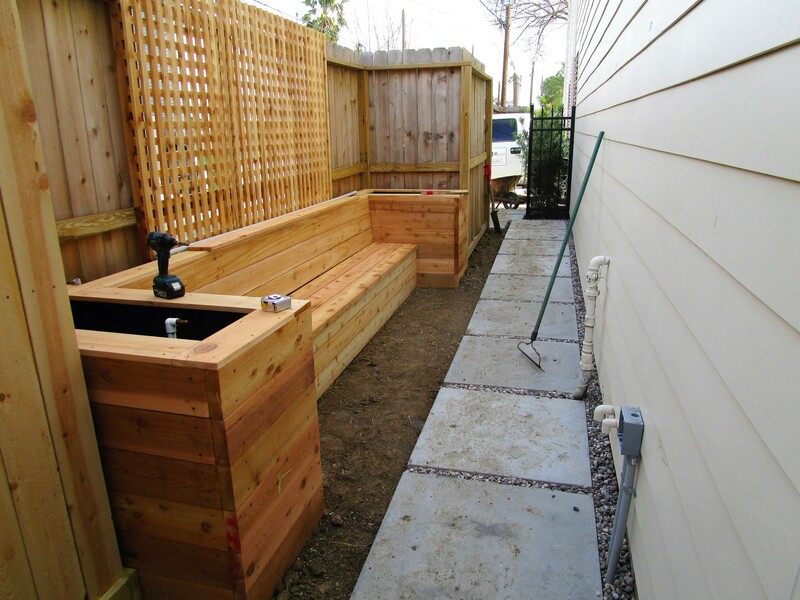 If you have been with us for a while you will know I love the challenge of taking a tiny yard and making it an outdoor entertaining room or area. 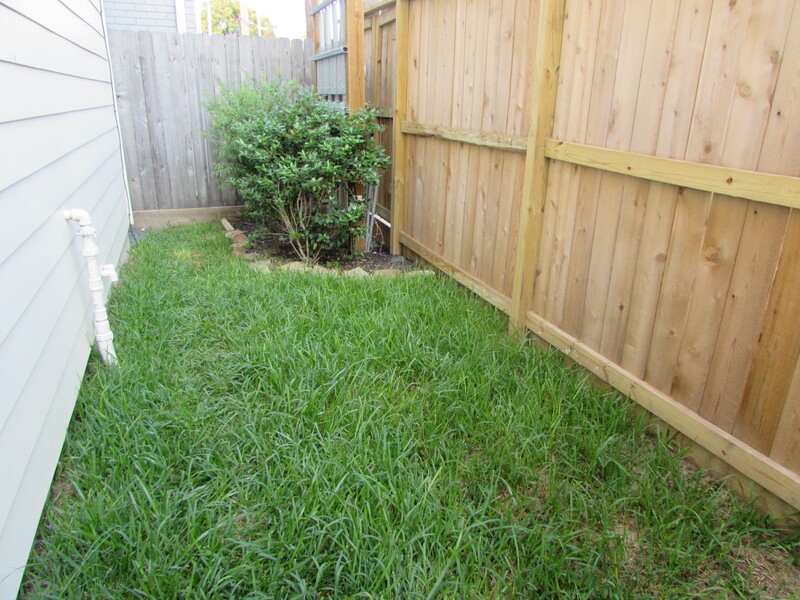 When we first saw it this yard was really just a grass path from the front to the back of this end unit town house. The pets were allowed to run through it but otherwise it was simply an underused space with so much potential; a town home with more than the postage stamp front ‘yard’. 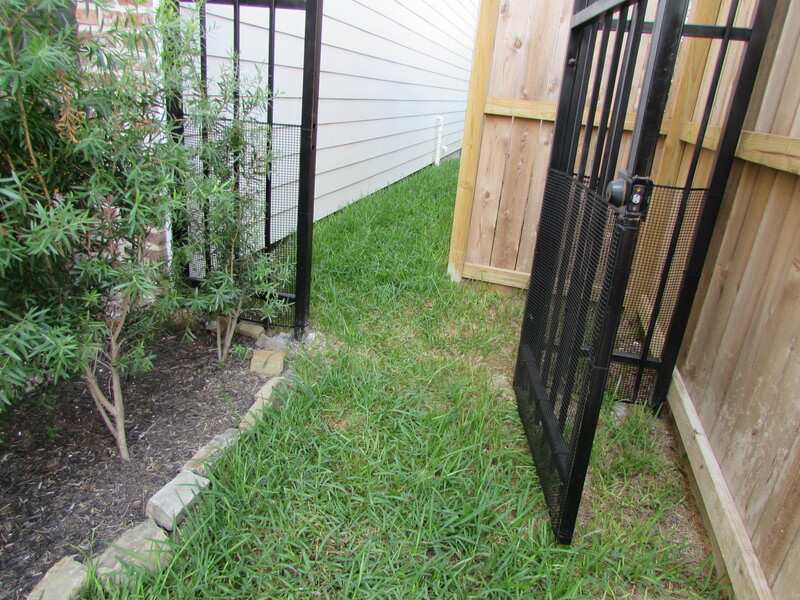 Here is a before photo from the entrance gate. To the right, on the other side of this fence, is an alley. This space is shared by the electrical meters for all the units on this side of the complex. The boxes in the far corner are actually accessed from the alley. The grass (well, ‘grass’) was already failing and was mushy ever time it rained. During the construction all sorts of construction debris was unearthed. My favorite is probably a partial five-gallon plastic bucket! The home owner wanted a place to relax, sit with friends and also grow herbs. By enclosing the utilities in the far corner (here in the left side of the photo) we created a little niche. 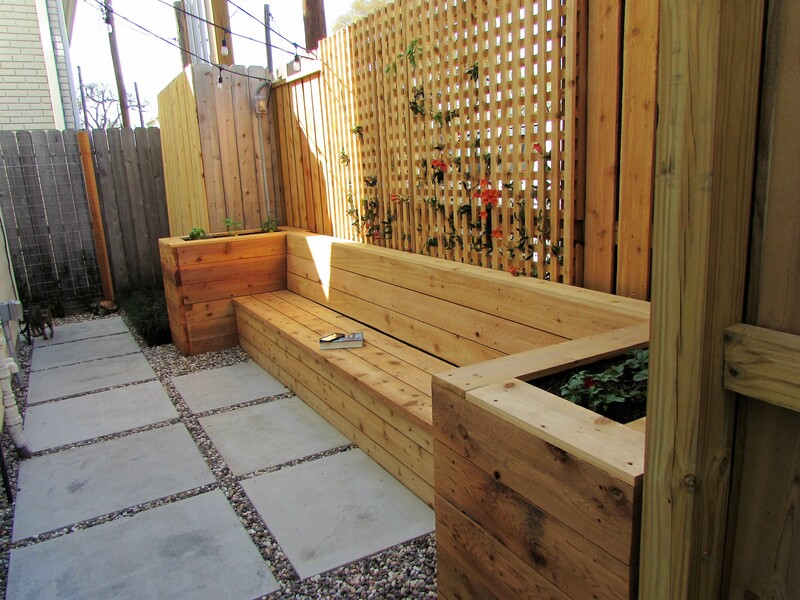 This lent itself to becoming a nestled seating area flanked by raised beds. At around three feet tall the beds will be easy to maintain without much bending and they will get a bit more bright light and great drainage being off the ground. 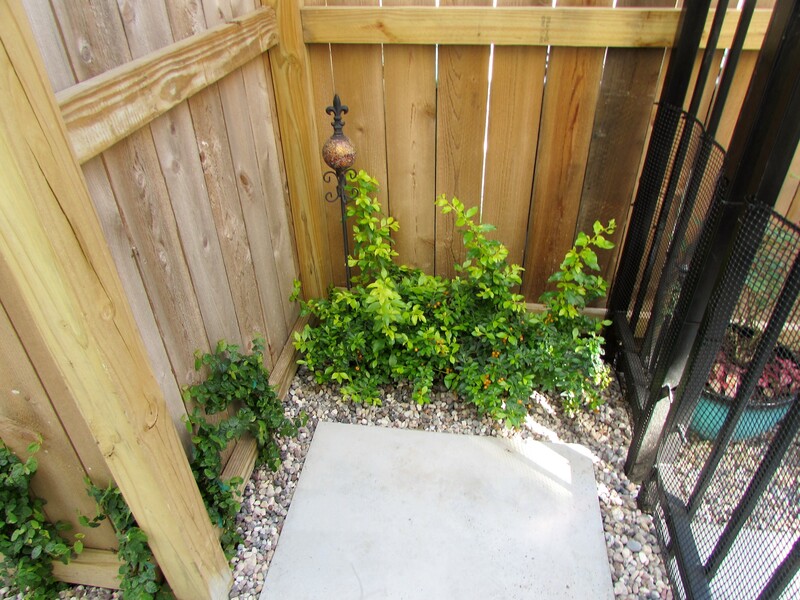 I decided the yard needed more light and air and I really wanted to have some green walls to get away from the narrow alley feel that the space had. 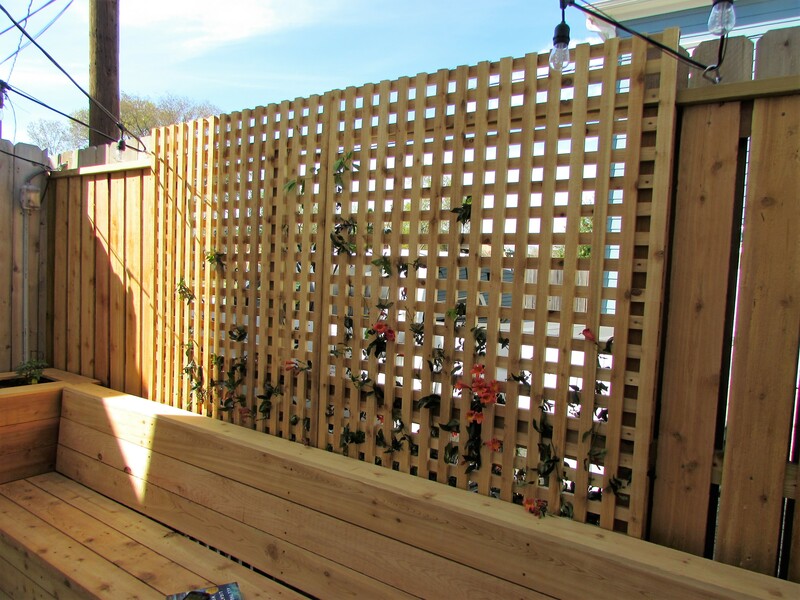 We took part of the fence off and replaced it with cedar lattice. This gave us light, air, and something for our vines to grow on! 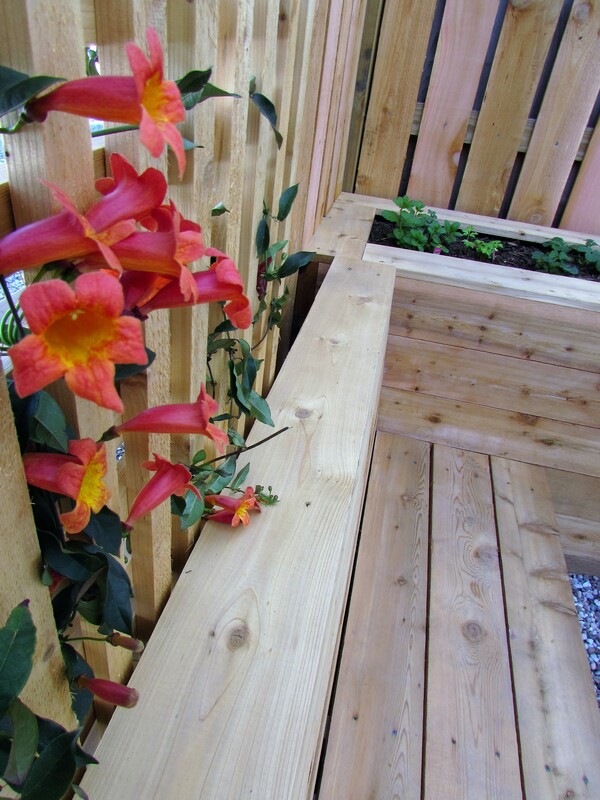 Here you can see the Tangerine Crossvine, Bignonia capreolata, already blooming and climbing up the cedar panels. The space is lit with industrial quality string lights. 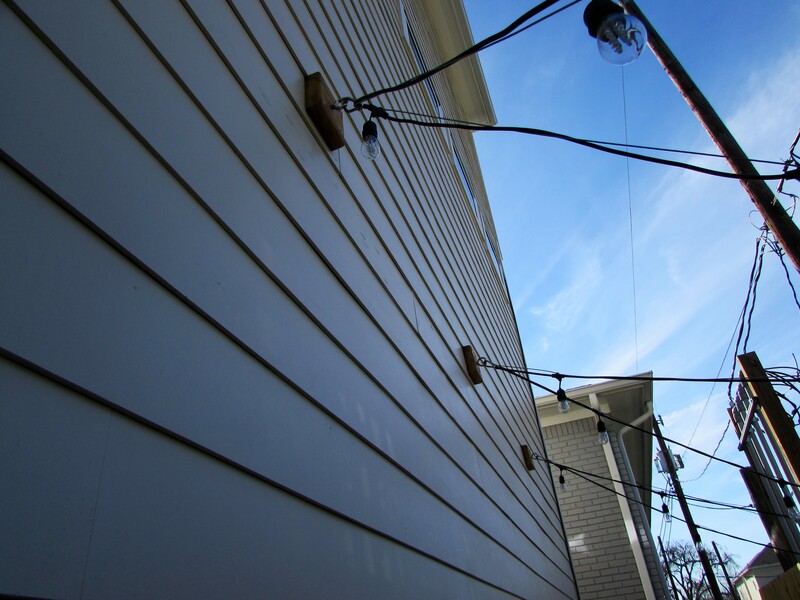 We used steel cabling to help support the lights and a hook system so that they can be removed easily at any time. The interval of the fixtures is determined by the desires of the client. At two foot spacing I hear they really brighten up this space at night. Lighting gives outdoor spaces much more versatility to use after the sun goes down (or before it comes up!). At the entrance we have Cuban Gold Duranta, Duranta erecta ‘Cuban Gold’ (great shade color year round with those electric leaves) and Fig ivy. These both will thrive in the bright shade. The fig ivy, once established, will cover the fence. It will need at least yearly maintenance to keep it neat. We continued the Fig ivy also know as Creeping Fig, Ficus pumila, around the corner. 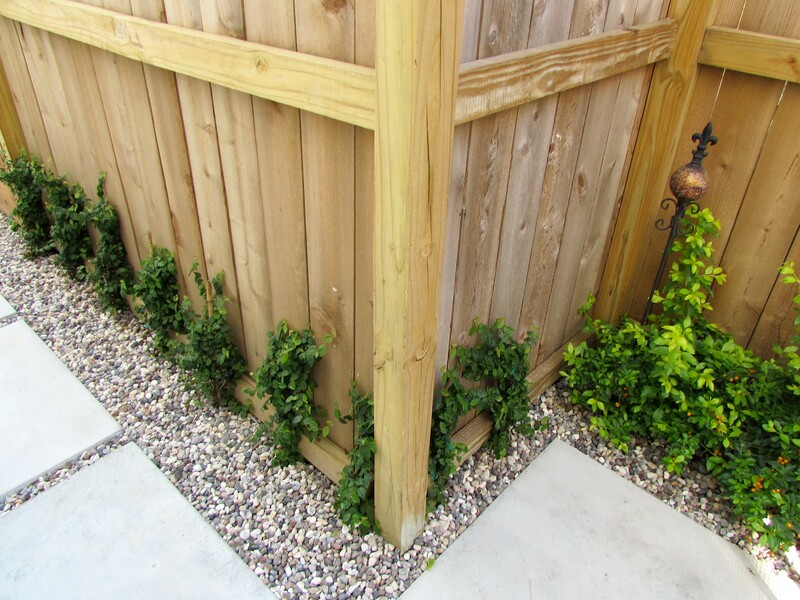 It is a very low water need vine that can grow in part shade. So in a year or so you will be greeted by a green wall and not a wood fence. You can see the dog, Sandy, is enjoying the new space already. I saw her up on the bench looking out through the lattice panel to the alley when we drove up. From here you can see how we boxed in the utility panel. We added an electrical outlet for the lights with extra spaces to plug in a fan or radio. Also we created a facade for the inside of the fence that flanked the lattice this gave us a finished, but simple, look which mirrored the lines of the surrounding spaces. The little dog enjoyed Shawn’s attention and posing for the camera so I thought I better give her her 15min. And you will notice evidence that the home owner was enjoying a the space when we arrived. Close up with herbs already planted. 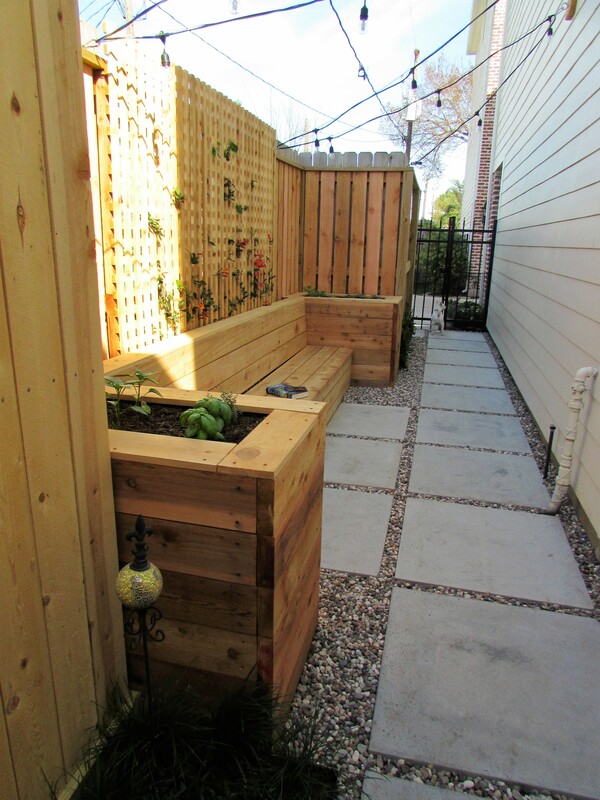 We like to encourage homeowners to plant their own herbs and vegetables…it is about feeling a real connection to the space. 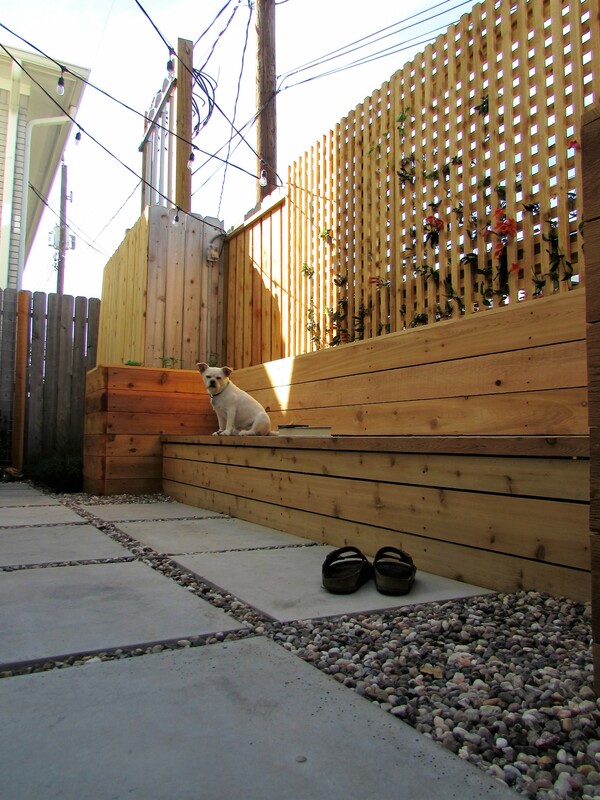 All of the wood (cedar) will grey nicely during the coming season and match the existing fence. The flowers of the Tangerine crossvine give a nice pop of color! They are in full bloom now for 6 to 8 weeks and then periodically you get a few flowers throughout the summer. You can see that the back of the bench is wide enough to set a drink 🙂 In this tight space we used Mondo grass as a ground cover. It is very low maintenance and will fill in nicely. There is a red dwarf Crape Myrtle in the corner but I don’t have a shot of it. It will need periodic light pruning to stay in the space but only wants to be 6 feet tall. Looking east! The string lights help keep the space cozy mimicking a ceiling Looking West! All of the beds use drip irrigation. 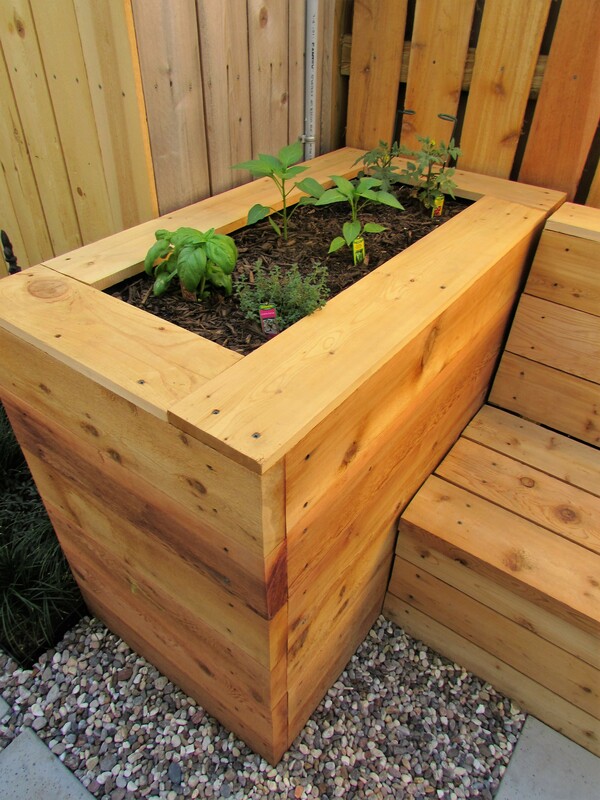 The raised herb beds are on their own zone so that the owner can water her herbs independently of anything else automatically. A zone for potted plants is also ready in anticipation of future additions. Even I am amazed how well this turned out! I have suggested a narrow bar table to go over the pipes on the wall and maybe some wall art. This is awesome! Well done on such a small space. Wow! What a challenge. Nicely done. 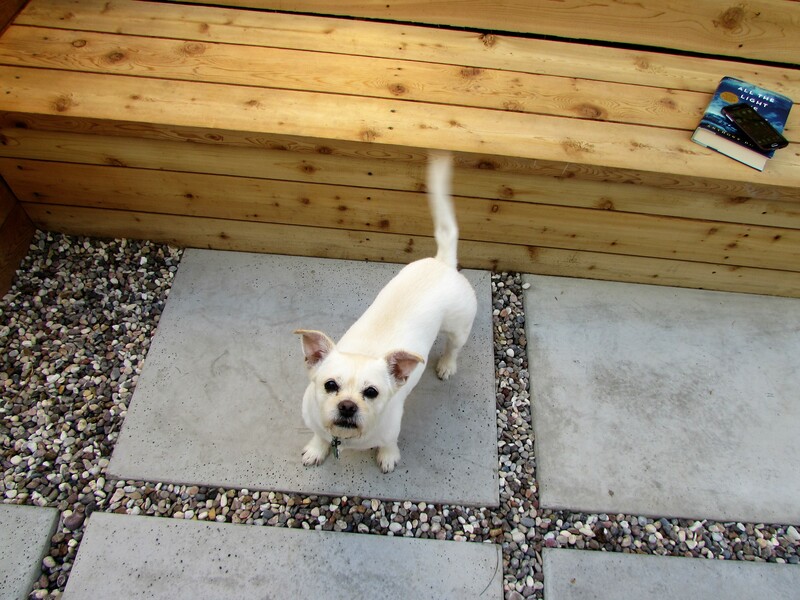 Hi Debra, thank you….sorry to take so long to replay, I am the GC on a major renovation here at my house!